An all-in-one solution to preparing baby food for every stage of weaning! Easy to use, wash and store. 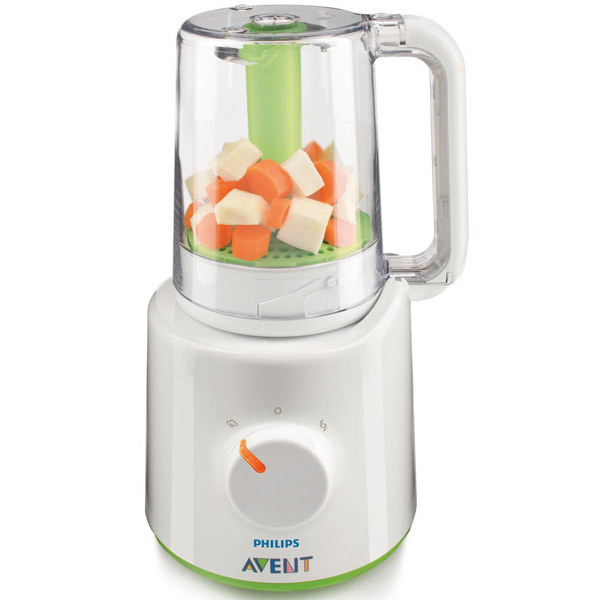 You can easily prepare healthy homemade baby food with the Philips AVENT Combined Baby Food Steamer and Blender: first steam fruit, vegetables, fish or meat and then simply lift and flip the jar over to blend it, with no transfer of food required! Supplied with a UK plug adaptor. Philips AVENT is delighted to be the No.1 recommended brand by UK Mums* with its products loved by Mums and Babies across the UK. Philips AVENT believes that breast feeding is the best method of nutrition for babies and that women should be given as much information and education as possible regarding the benefits of breast milk. Philips AVENT believes that it is every mother's right to make her own personal decision to how she feeds her baby – bottle, breast or a combination of both - and Philips AVENT will support her in whatever choice she makes.